Michel Hazanavicius (French pronunciation: [mi.ʃɛl a.za.na.vi.sjys]; born 29 March 1967) is a French film director, producer, screenwriter and film editor best known for his 2011 film, The Artist, which won the Academy Award for Best Picture at the 84th Academy Awards. It also won him the Academy Award for Best Director. He also directed spy film parodies OSS 117: Cairo, Nest of Spies (2006) and OSS 117: Lost in Rio (2009). Hazanavicius was born in Paris. His family is Jewish, and originally from Lithuania. His grandparents settled in France in the 1920s. Before directing films, Hazanavicius worked in television, beginning with the Canal+ channel, where he started as a director in 1988. He began directing commercials for companies such as Reebok and Bouygues Telecom, and then, in 1993, he made his first feature-length film, La Classe américaine, for television. The film, co-directed with Dominique Mézerette, consisted entirely of footage taken from various films produced by the Warner Bros. studio, re-edited and dubbed into French. In 1997, Hazanavicius directed his first short film, Echec au capital, and followed it up with his first theatrically released feature, Mes amis, which starred his brother, actor Serge Hazanavicius. Seven years later, Hazanavicius wrote and directed his second feature, OSS 117: Cairo, Nest of Spies, a parody of 1960s spy movies and specifically of OSS 117, a popular character created by Jean Bruce in 1949. The $17.5 million film was a modest box office success, with $23 million worldwide receipts. A sequel, OSS 117: Lost in Rio, followed in 2009. Both films were later distributed in the United States by Music Box Films. The Artist, a black and white film without dialogue which takes place in Hollywood on the eve of sound film, screened in competition at the 2011 Cannes International Film Festival. The Artist was later released to universal acclaim. 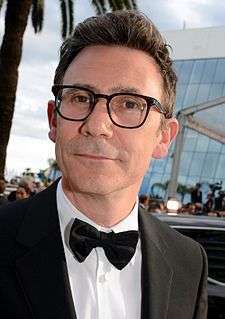 On 24 January 2012 Hazanavicius received nominations for three Oscars: the Academy Awards for Best Director, Best Original Screenplay and Best Film Editing. Hazanavicius said winning an Oscar would be "like dreaming of going to the moon – you don't really believe it could ever happen." Hazanavicius won the Academy Award for Best Director for The Artist, at the 84th Academy Awards. He was invited to join the Academy of Motion Picture Arts and Sciences in June 2012 along with 175 other individuals. He contributed a section to the omnibus film The Players (Les Infidèles) starring Jean Dujardin. He has announced that his next feature film will be a remake of the 1948 Fred Zinnemann film The Search. The film will star Berenice Bejo in the Montgomery Clift role as an NGO worker helping a little boy find his family in modern-day Chechnya and will be produced by Thomas Langmann. Golden Globe Award actress winner Annette Bening will star in the film. Hazanavicius was in a relationship with film director Virginia Lovisone, and they have two daughters together, Simone and Fantine. He is married to Bérénice Bejo, who acted in his films OSS 117: Cairo, Nest of Spies, The Artist and The Search. Hazanavicius and Bejo have two children together: Lucien and Gloria. 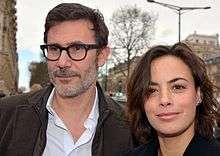 Hazanavicius with his wife Bérénice Bejo. ↑ Robinson, George (27 December 2011). "'The Artist' Director's Nod To Billy Wilder". Thejewishweek.com. Retrieved 27 February 2012. ↑ "French "Artist" Director Knows What "Mazel Tov" Means". Showbiz411.com. Retrieved 27 February 2012. ↑ Bloom, Nate. "Interfaith Celebrities: Golden Globes and Television". Interfaithfamily.com. Retrieved 27 February 2012. 1 2 Michel Hazanavicius. Allocine. ↑ OSS 117: Cairo, Nest of Spies. Box Office Mojo. ↑ "The director of the silent movie The Artist...speaks!". MyNorthwest.com. 29 January 2012. ↑ "'The Artist' Wins Big at the Oscars". Rollingstone.com. 27 February 2012. Retrieved 1 March 2012. ↑ "The Artist Wins Big as Oscar Romances Past". Wall Street Journal. 27 February 2012. Retrieved 1 March 2012. ↑ "'The Artist' Helmer Michel Hazanavicius & Wife Berenice Bejo Reteaming For Movie Inspired By Fred Zinneman's 'The Search' | The Playlist". Blogs.indiewire.com. Retrieved 27 February 2012. ↑ "Chouchou et Loulou se sont dit oui". Gala (in French). 25 July 2009. Retrieved 31 August 2011. ↑ "Oscars 2012: Nominees in full". BBC News. Retrieved 24 January 2012. ↑ "2011 EDA Awards Nominees". 23 December 2011. Retrieved 23 December 2011. ↑ "2011 EDA Awards Winners". 30 January 2012. Retrieved 30 January 2012. ↑ "AACTA International Award Nominees" (PDF). Australian Academy of Cinema and Television Arts (AACTA). 15 January 2012. Retrieved 15 January 2012. ↑ "Bafta Film Awards 2012: Nominations". BBC News. 17 January 2012. Retrieved 17 January 2012. ↑ Pond, Steve (11 December 2011). "'The Artist' Named Best Picture by Boston Film Critics". The Wrap. Retrieved 11 December 2011. ↑ Chang, Justin (22 May 2011). "'Tree of Life' wins Palme d'Or". Variety. Retrieved 22 May 2011. ↑ "37th César Awards (2012) Nominees". Retrieved 28 January 2012. ↑ "Tree of Life Leads CFCA Nominations with 7; Descendants, Drive Follow with 6". Chicago Film Critics Association. 2011. Retrieved 6 January 2012. ↑ "CFCA Names Tree of Life Best Picture". Chicago Film Critics Association. Retrieved 6 January 2012. ↑ "17th Annual Critics' Choice Movie Awards (2012)". Critics' Choice Awards. 13 December 2011. Retrieved 13 December 2011. ↑ "Denver Film Critics Society Announces 2012 Award Winners". Yahoo! Movies. Retrieved 11 January 2012. ↑ "Best of 2011". Detroit Film Critics Society. Retrieved 20 December 2011. ↑ "The Artist's Michel Hazanavicius takes directing honour". BBC News. 29 January 2012. Retrieved 30 January 2012. ↑ "Les Etoiles d'or du cinéma français". Etoiles d'or. Archived from the original on 15 April 2012. Retrieved 3 March 2012. ↑ "Florida Film Critics swoon for 'The Descendants'". Miami Herald. 19 December 2011. Retrieved 6 January 2012. ↑ "The 69th Annual Golden Globe Awards Nominations". Hollywood Foreign Press Association. 15 December 2011. Retrieved 18 December 2011. ↑ Lodge, Guy (11 December 2011). "'The Artist' leads with 7 Houston film critics nods". HitFix. Retrieved 12 December 2011. ↑ Pond, Steve (29 November 2011). "'Take Shelter,' 'The Artist' Lead Indie Spirit Award Nominations". Reuters. Retrieved 4 December 2011. ↑ Kemp, Stuart (20 December 2011). "'Tinker Tailor Soldier Spy,' 'Drive' Lead London Critics' Circle Nominations". The Hollywood Reporter. Retrieved 6 January 2012. ↑ "The New York Film Critics Circle has named The Artist the year's best film". usatoday. 29 November 2011. Retrieved 29 November 2011. ↑ Pond, Steve (11 December 2011). "'The Artist' Wins Another: NY Film Critics Online". The Wrap. Reuters. Retrieved 11 December 2011. ↑ "Oklahoma Film Critics Circle names "The Artist" best film of 2011". Oklahoma Film Critics. 23 December 2011. Retrieved 23 December 2011. ↑ Tapley, Kristopher (26 December 2011). "'Tree of Life' leads with 7 nods from Online Film Critics Society". HitFix. Retrieved 27 December 2011. ↑ "Phoenix Film Critics Society 2011 Award Nominations". Phoenix Film Critics Society. Retrieved 6 January 2011. ↑ "Phoenix Film Critics Society 2011 Awards". Phoenix Film Critics Society. Retrieved 6 January 2012. ↑ "2011 Winners". 19 December 2011. Retrieved 20 December 2011. ↑ Vlessing, Etan (9 January 2012). "Michel Hazanavicius' 'The Artist' Named Best Film by Vancouver Film Critics". The Hollywood Reporter. Retrieved 11 January 2012. ↑ "The 2011 WAFCA Awards". dcfilmcritics. 19 December 2011. Retrieved 19 December 2011.